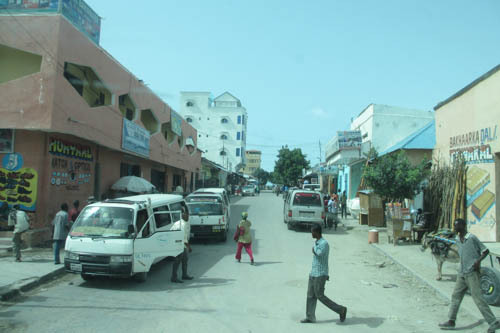 Roaming the streets of Mogadishu for the first time, my eyes are on stalks, my ears pricked; trying to take everything in and start to discover the city that has until now been just another news report about an attack or a bomb. What I find is a sprawling city, much bigger than I had imagined, bustling with people getting on with their lives. I’m travelling in a three-vehicle ‘Casper’ convoy of Ugandan soldiers from the African Union mission here in Somalia. This particular patrol usually accompanies the Force Commander around but as he’s out of the country, we have the use of it for the day. We’re off to Maslah. It’s a drive North-East, about twenty kilometres from central Mogadishu up the coast, and where the Ugandan Battle Group have their Headquarters. Once we’ve negotiated the crowded centre of town, I’m told by the patrol commander that we’ll have to go through the district of Sokoro, on the outskirts of the city. Here houses become more sparse, the dirt road widens and we’re heading out towards less built-up bushland. Sitting next to me, he tells me with a twinkle in his eye and a broad grin that this is the district where they always get hit. “They like to attack us here, this is where Shabaab still think they have a bit of power, they try small arms fire and sometimes IEDs, so we are prepared”. “But we’ll be fine” he says, and chuckles. As it turns out, Al Shabaab must be out for lunch as the locals continue to carry their shopping and push their carts of straw up the road and there’s not so much as a dog barking. My friend seems almost disappointed. We are welcomed like old friends at the camp at Maslah and taken on a brief tour of the basic but well-protected HQ, before meeting the newly arrived commander, Colonel Kimbowa. Over sweet juicy orange segments and digestive biscuits – huge treats that we do not get on our camp – he describes his area of operations and jokes that he feels quite at home as the countryside is very similar to that in his native Uganda. He’s optimistic about the improvement in security and while admitting there are challenges ahead, is confident that the war in Mogadishu at least has been won. He’s looking forward to his year-long tour here and believes he and his men can bring invaluable experience to help, since their own country was itself “at war for so long and had its own similar problems”. 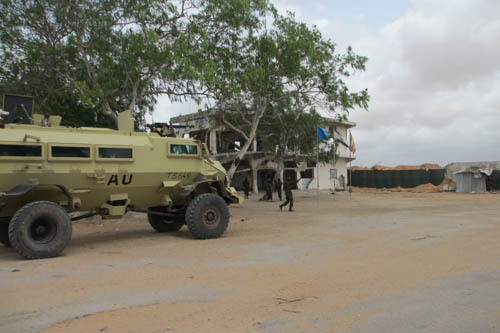 It’s a symbolic place for the African Union troops to have control over; Maslah used to be one of Al Shabaab’s main bases on the outskirts of Mogadishu. They planned and launched their operations from this high ground surrounded by bush. I’m shown a row of eucalyptus trees and told this is where enemies and defaulters were hanged as examples to the rest of the community. Urban myth or fact; the soldiers are proud of their achievements in Mogadishu and from my first impression rightly so. From the street corner gunfights and bloody battles a couple of years ago, this city has come a long way. The only obstacles to our patrol were vendors taking their produce to market, long lines of trucks queuing to deliver goods to the port, and an unruly herd of goats taking their young minder for a walk. This entry was posted in Somalia and tagged adventure, Africa, African Union, Al Shabaab, AMISOM, AU, conflict, Lorna Ward, Mogadishu, Somalia, troops, Uganda. Bookmark the permalink.